Restored building heralds a new century of classic hospitality. When you step into the Adelphi Hotel, look for the pineapples. Lush golden shapes of the sunny fruit, a centuries-old symbol of welcome, are splashed upon the royal blue carpet that rolls into the lobby and travels up the grand staircase. After a five-year renovation project estimated to cost $32 million, the historic Adelphi, the only surviving hotel from Saratoga Springs’ Golden Age, reopened on Oct. 1, and is now offering luxury accommodations to out-of-town guests. and sipping cool summer cocktails in its charming courtyard garden, are rediscovering their beloved Adelphi. 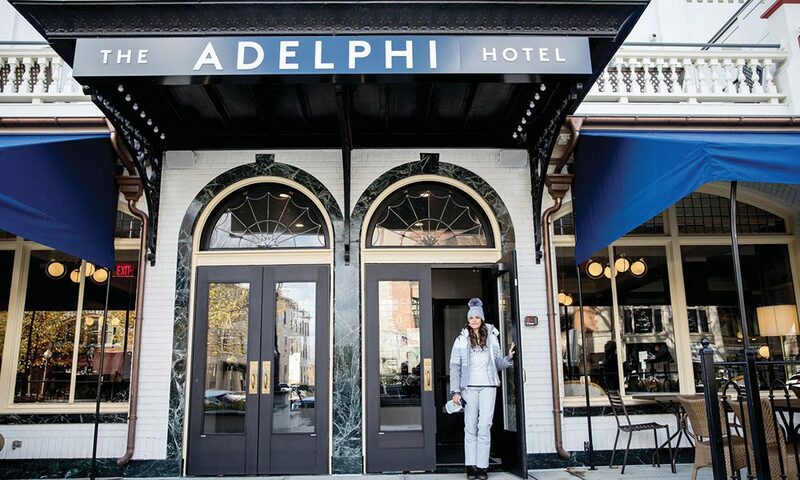 Adelphi Hospitality Group, the hotel’s new owners, are hoping that local residents, along with overnight guests and tourists, make themselves at home on the main floor of the boutique hotel — in the lobby, in Morrissey’s bar, in the Grand Ballroom and The Blue Hen restaurant. “Use it as your second home. You will get a kick out of it,” Simon Milde told a crowd at the hotel’s ribbon-cutting, on Oct. 19. Built in 1877, the Adelphi is a striking Broadway landmark of late 19th century Italianate architecture, distinguished by box pillars that rise from a wide piazza. After consulting historic photos, the new owners changed the exterior from its old brown-and-yellow to a bright cream color. At night, the decorative cornice that crowns the Adelphi is now illuminated, enhancing its starring role on Broadway. “This is the closest it’s been to its original façade,” Steven Bouchard, the hotel’s marketing coordinator, said during a recent tour. Outside the front doors, guests who wish to take a spin around town will find shiny gold Martone bicycles ready to go in a rack near the valet parking podium. black-and-white color scheme punctuated with blue accents, an old-fashioned wooden phone booth and contemporary chandeliers. Dishes from the old hotel are artfully displayed on the wall behind the reception desk. A Victorian couch and armchairs — furniture that will remind locals of the old hotel — have been re-upholstered in velvety golds and blues that complement their antique lines and our contemporary times. About 50 pieces from the old hotel have been refurbished and re-introduced. 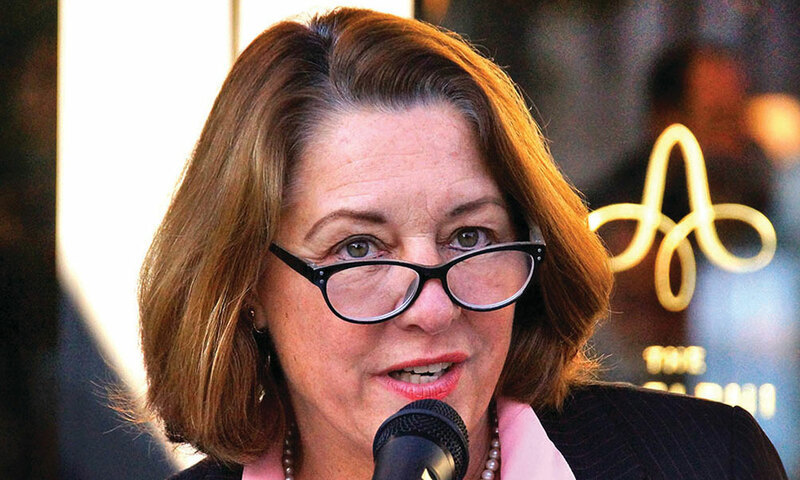 “We understand that the Adelphi is a community treasure. The lobby is meant to be inviting to the community,” said Jean Marie Phillipou, a consultant and project manager for the hotel property. 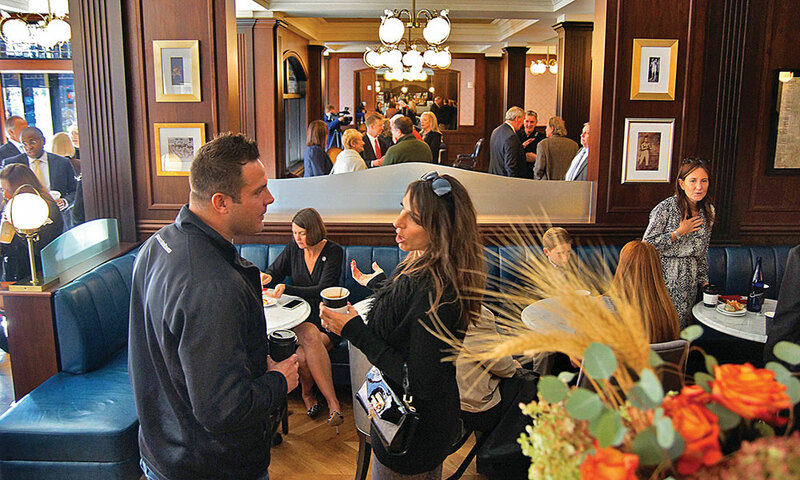 At Morrissey’s, which is open for lunch, dinner and cocktails, visitors can grab a coffee and relax in the lobby. In Morrissey’s, the atmosphere is old-time tavern, with decorative touches like an antique cash register from the original hotel. “There is no dress code, there are no white tablecloths,” said Bouchard. Toasting John Morrissey, the bar’s namesake, is sure to become a tradition, as there are photographs of one of Saratoga’s most fascinating characters posted near the bar. A poor Irish immigrant who taught himself to read and write, Morrissey became the bareknuckle boxing champion in America. After he left the sport, he helped start Saratoga Race Course, opened an exclusive gambling casino in Congress Park, and served as a congressman and state senator. The Blue Hen, set for a November opening, will seat 60 for breakfast and dinner under a soaring glass atrium, with views of the sky and the steeple of Universal Preservation Hall. An outdoor courtyard with umbrella tables will debut next spring, when landscaping will be added. “It will take two years for it to become a garden. There will be lush greens in patterns along the walls,” Philippou said. Of the 32 luxury suites, the most prized will be the Travers and Whitney Suites on the second floor, as each opens onto a large veranda that overlooks Broadway. “It’s one of the iconic balconies of Broadway,” says Bouchard. Morrissey and Cornelius Vanderbilt, the richest man in America in his day, once sat and chatted on this veranda. Adjoining the two suites is a library, open to all overnight guests, with a faux fireplace and shelves of cloth-bound books. During the renovation, the interior of the hotel was reconfigured to create larger rooms. The brand-new bathrooms are also super-sized, with soaking tubs and huge walk-in showers. One room, the Polaris Suite, has a private outdoor hot tub. Still in the planning stage is a 10,000-square-foot health and wellness spa with an indoor swimming pool. The spa would be part of a new six-story, 152-room hotel that Adelphi Hotel Partners plan to build behind the Adelphi hotel. If approved by the city, the ownership hopes to begin work next fall. During the renovation of the Adelphi, when its massive original trusses were found to be compromised, a steel superstructure had to be constructed and the building was then hydraulically lifted on top of it. The Adelphi was rebuilt to survive yet another century, to create memories for future generations, the new owners say. It will be marketed internationally as a destination hotel, a place as unique as Saratoga Springs itself. When you look for the pineapples at the hotel, keep your eyes open for another symbol borrowed from nature. During the tour, Bouchard also pointed out the images of bees that appear here and there.